Before I discuss Jamie, I must recognize this day. 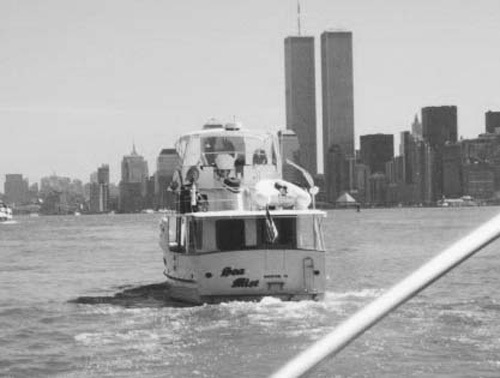 Quite a few years ago, friends who lived aboard their boat cruised into New York Harbor. This low resolution image has stood out in my mind since THAT DAY. While in Juneau, we ate lunch in a restaurant – The Hangar. Several years ago we had been in Juneau and ate at The Hangar twice, it was that good. This time was no different. Our waitress was friendly and helpful, and her eyes sparkled. I do notice those things! While eating, the lunch crowd thinned out and Jamie had time to talk to other customers. I mentally recorded the light sources, and what direction would be best for a portrait. When first doing portraits of strangers, I did waitresses, baristas, and other service workers a lot – it was great practice. Lately, I have mainly walked up to strangers in the great outdoors. We struck up a brief conversation. She had moved to Juneau only three weeks earlier. I did not write down where she had moved from, but it was one of the states in the upper left hand corner of the Continental U. S., maybe Montana. She was glad to be photographed: of course, I had not yet left the tip :-).